For a long time gold has been considered garish and tacky but it’s enjoying a huge comeback, although not in an ‘Elton John glasses’ kind of way. With the wide use of natural stone in remodeling, especially kitchens and bathrooms, gold is more than infiltrating the market. The natural stone industry is subtly using granite and marble to emphasize gold, and the effects are spiraling upward in places throughout homes everywhere. Natural stone with gold veins punctuating a huge collection of colors are being imported from quarries all over the world. Traveling from countries on all seven continents in large slab containers, natural stone is brought to us from places like Brazil, India, Thailand, and many others. The containers hold thousands of pounds of raw stone slabs in many colors. SlabMarket carries numerous stones from many quarries that you can stock your inventory with. Madura gold granite, shown below, is a lovely granite straight from India. 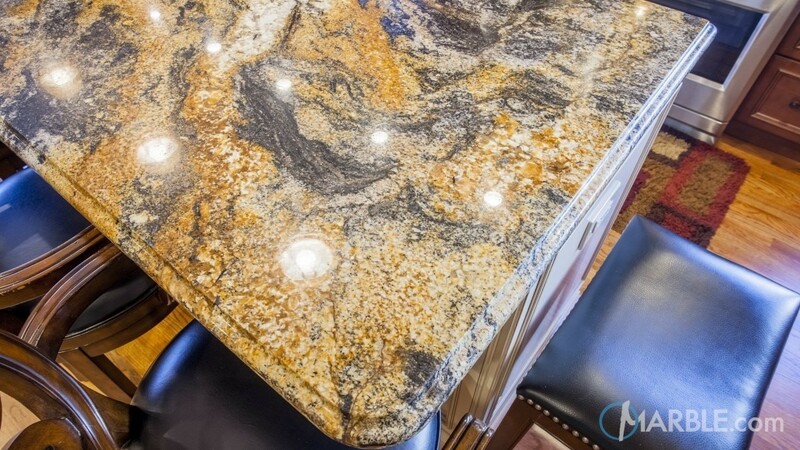 The beauty of granite fuels its own growth, and Madura gold granite’s splendor is one of the examples of why some natural stone is making such resurgence. Madura gold granite is finding its place as countertops, showers, fireplace surrounds and even exterior walls. It’s used for numerous design applications including mosaics, and wet bar counters. It’s tough and can last a very long time making it a great option for high-traffic kitchens. Madura gold granite has distinctive shades of beige, some grays, and mostly on a creamy palette, along with the wonderful gold veining. 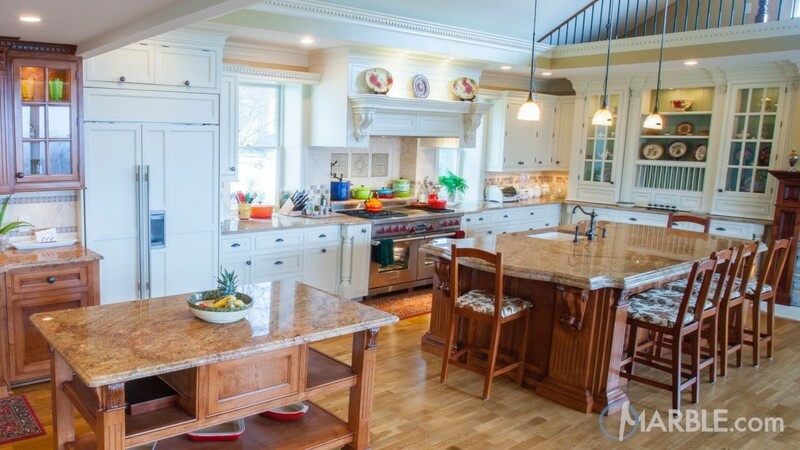 If you want something to set off those clean looking stainless-steel appliances, Gold Antique granite is a gold colored granite that will brighten your kitchen. Gold Antique granite, also from India, is a light granite with beige and gold veining throughout. If your taste in décor is one that admires the light color granite, but you don’t want a fully bright white, design in some dark trim, or add dark bar stools to your kitchen island. Accents can be added from anywhere such as cabinet knobs, handles and/or sinks. Tiger Eye Gold gemstone, like the tiger’s eye you see in jewelry, is brought in from all over the world such as Australia, Burma, India, Namibia, South Africa, the United States, Brazil, Canada, China, Korea and Spain. Tiger Eye Gold is what as known as a chatoyant gemstone and is usually a metamorphic rock. The gold in Tiger Eye Gold blends nicely with shades of red and brown, and polishes to an outstanding honeyed gleam. It can be used in a variety of applications from countertops to butler’s pantry’s. The exceptional gold forms a mosaic, that gives a free flow type of feeling in the gemstone, allowing it to blend well with almost any furnishings. Another gold available, among the many granite colors SlabMarket imports, is Magma Gold granite, Shown below. Falling into the ornamental stone category is this stone from Brazil. Imagine a black canvas with considerable splashes of gold that gives the stone a breath of life on their own. The strong contrast of the black pitted against the gold is dramatic. This gold is another that can be used almost anywhere. It works as a kitchen countertop, a wet bar top, any nature of surround, and of course, it brings elegance to any bathroom vanity. Number five on the list is just as beautiful as the first four is Jerusalem Gold marble, and SlabMarket imports this incredible marble to slab yards for use as floors, certainly countertops, a butler’s pantry like we mentioned before, but this marble would go really great in the shower or as a bathtub surround. It may have started out as a limestone deposit but time, heat and pressure have turned it into this beige and gold marble with a perfect unstated elegance. No matter your customer’s tastes, SlabMarket has something for everyone, and with the strengthening inclination in gold, your customers seeking a subtle pop of this color might be interested in one of these five stone colors. One of these five might make it into a fabulous home.